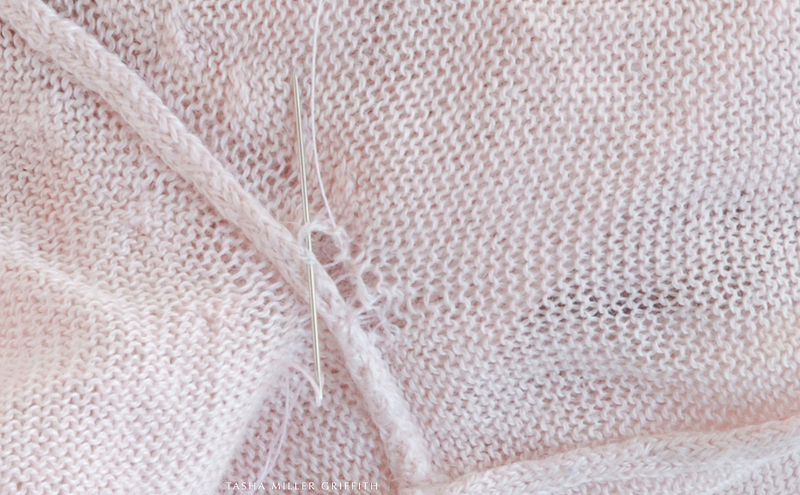 Before I lose anyone who doesn’t currently have a sweater to fix, I’d like to mention a couple of really interesting things about mending and repair I’ve come across while working on this post. 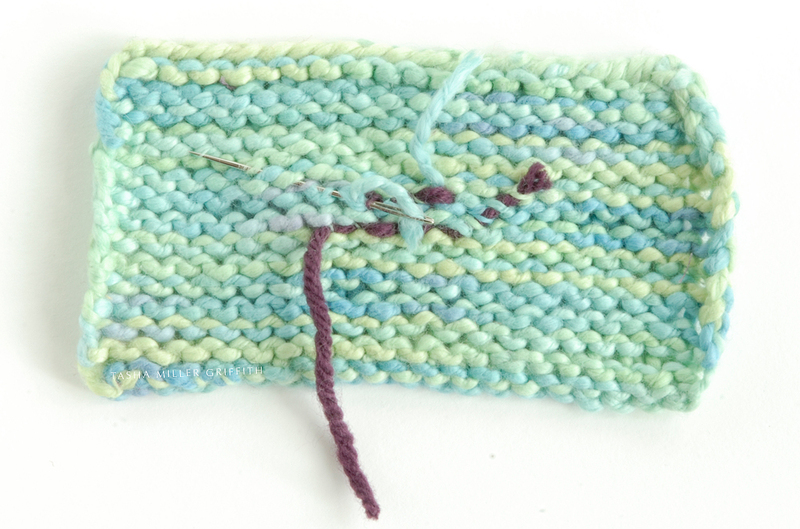 The first one is Tom of Holland’s Visible Mending Programme, which is based on darning knits and on the idea that mending is something to be proud of. Pretty much needless to say, I love this idea and it’s implications. The second one is about fixing all kinds of other things, I saw it just yesterday (via Boing Boing via Root Simple) it’s a project by Paulo Goldstein called Repair is Beautiful in which he repairs all kinds of things (like a lamp, a chair, headphones) in unusual and beautiful ways. I love the aesthetic of his project, it says all kinds of provocative things about repair, not just that it can be lovely and unusual to look at, but also he’s calling attention to the repairs, asking you to think about what it means to fix something. Check it out, the pictures are way better than my description. So, after all that, just an invisible mend for today – kind of disappointing I know, sorry! I do have some ideas for visible mending of a couple of things now in my to-fix pile, and I’ll share them as they are done, but sometimes, you just need to repair a little hole. The idea for his post started a month or so ago, when I realized that two of my favorite light sweaters/tops were sprouting holes under the arms. Not big enough holes to need filling in/darning, but still enough to need fixing before they got out of hand. Sometimes I even happen to catch a problem when it’s still a thread that’s about to break, like the one near the arrow below. Most of the time, I don’t notice until it’s more like the hole on the left. If you do find a weak thread that’s still intact, you can “trace” along it, following its path with a new stronger thread. This is a fine gauge sweater, and I had sewing thread almost exactly the same color, so I used that. You can also try embroidery floss or yarn of various types and thicknesses to get something close to your garment yarn, or something you like as a contrast. 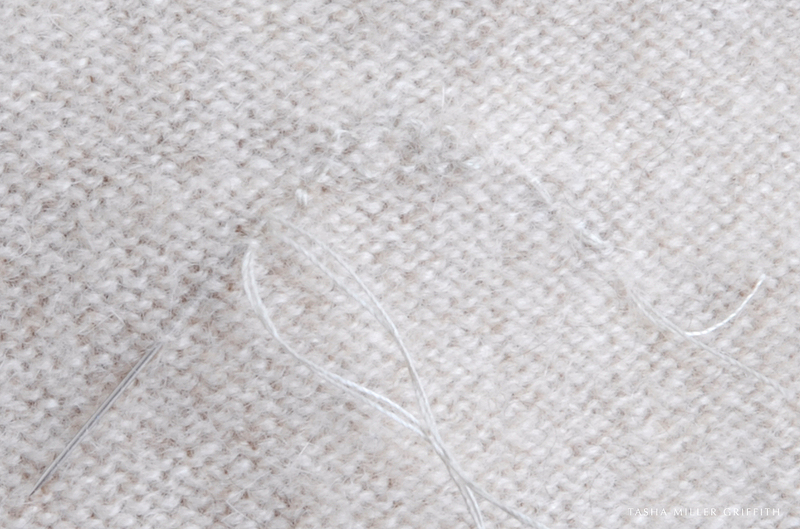 There will probably be at least one stitch that is only made up of the mending thread, so if you want it to be invisible, choose something as close as possible to the original yarn of the garment. We’re now looking at the sweater from the inside. 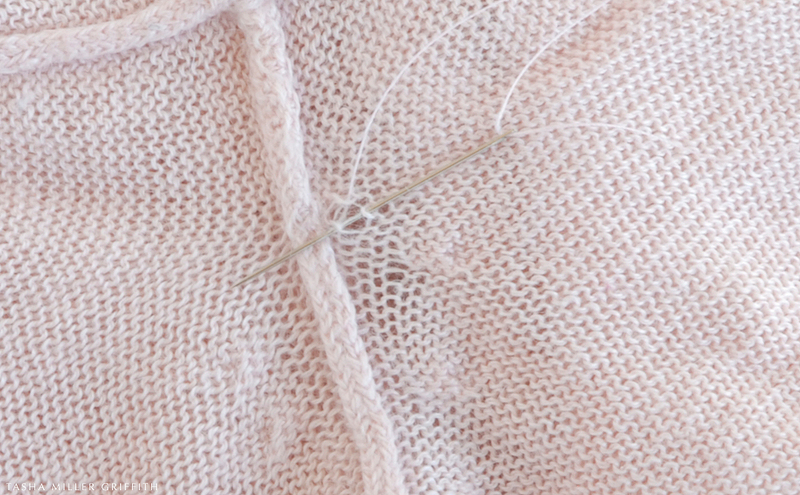 I like to start a repair like this by anchoring the thread somewhere where you won’t see it, like in the seam or in the back of a nearby intact knit stitch, with a couple of back stitches. Then I start picking up the parts of the sweater that are coming apart. Can you see how the thread and needle are following the path of the weak stitch? In this case, that’s all I need, so I’ll go back to the seam, take two more back stitches, bury and clip the thread, and I’m done. Ok, how about a hole that’s progressed a little further? Also illustrated further down is a small hole with one broken thread, keep scrolling down for that one. I’m not going to lie, it helps to have a really small crochet hook, or another tool with a tiny hook on the end. 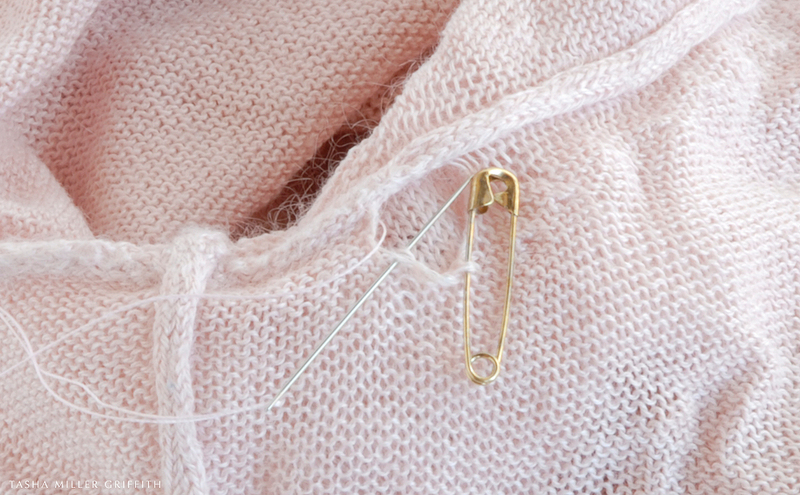 It may also help to use a safety pin to hold any stitches that may pop loose while you work on the rest. When you have picked up as many of the stitches as you can, it’s time to stitch the hole closed. Start by anchoring the thread with backstitches again, in this case in the nearby seam. For a small hole right near the seam like the one in this pink sweater, I basically stitch the sides of the hole to the seam, making a couple of passes and trying to keep my sewing stitches looking as much like the knitting as possible, which often involves going back and forth and going though each knitting stitch more than once. Again resist the temptation to pull the thread very tight, or you’ll pucker the fabric. 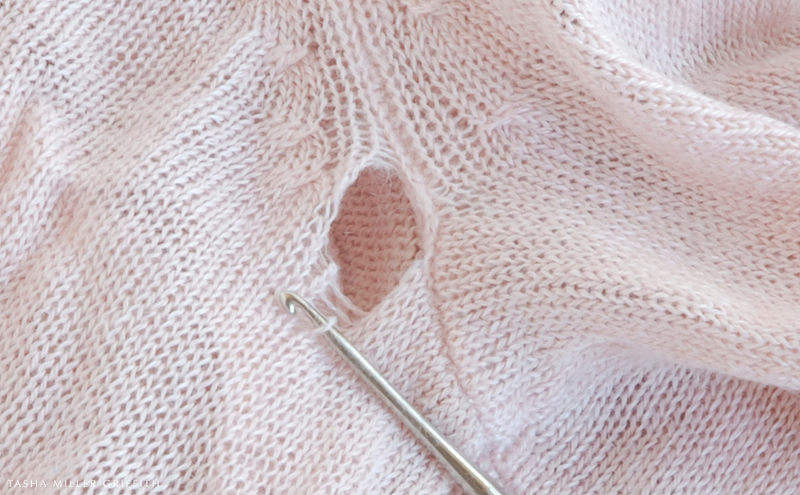 If the hole is in the middle of an area with no seams, still start by picking up any dropped stitches that you can. 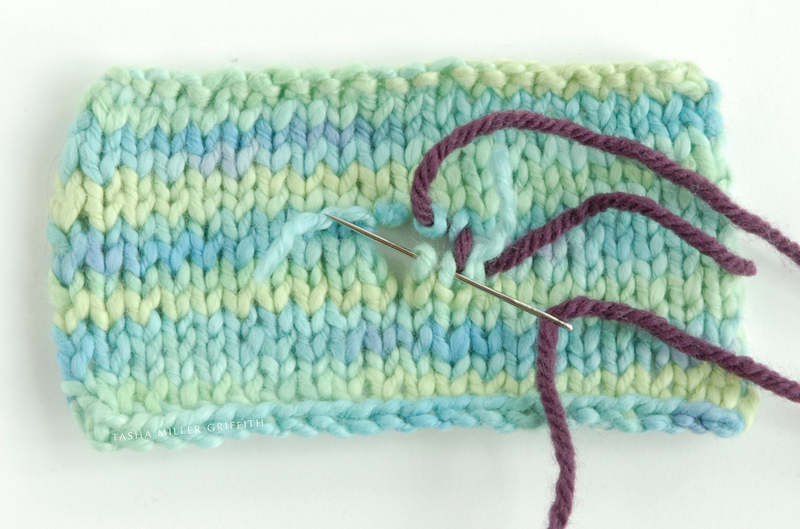 Take the anchoring backstitches through only the wrong side part of a nearby stitch, so that they don’t show from the outside. Bury the thread between backstitches by moving diagonally, again piercing the stitches and not going all the way through to the front side. In a garment with thicker yarns, you can fix the hole first and bury the yarn ends later, the body and friction of the thicker yarn will usually keep them from unraveling, although of course you can also do backstitches if you wish. 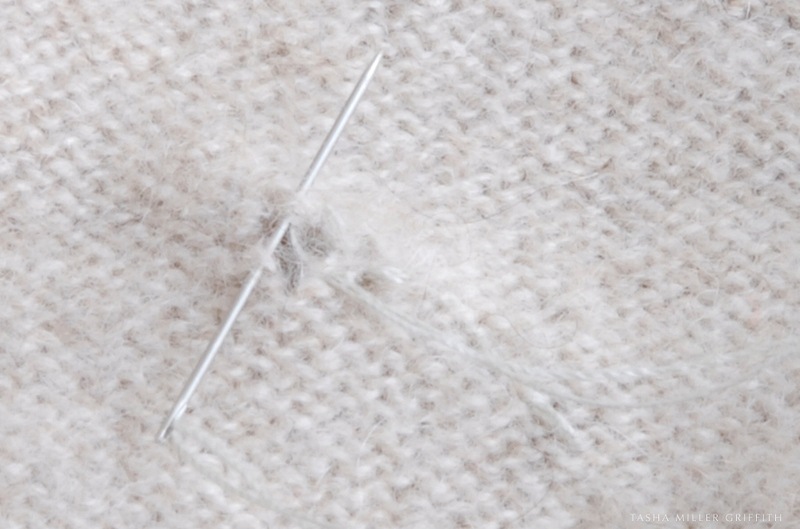 In any case, avoid pulling the mending yarn too tight or the fabric will pucker. If the hole is too big to look good when pulled almost closed, it’s time to darn it, which will make a more visible patch. (Look up “darn a sock” if you aren’t sure how. You could start with Zoe’s post about it, which is where I first found out about Tom of Holland as well). 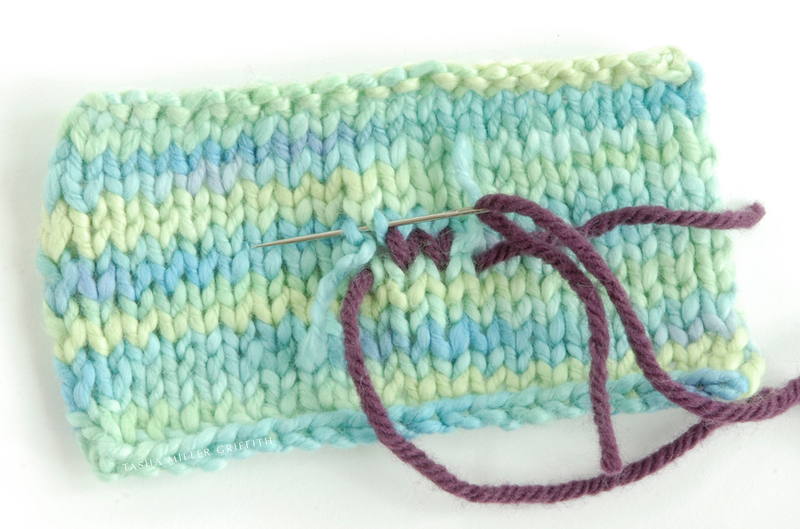 The mend will be most invisible if you can mimic the structure of the knitting. 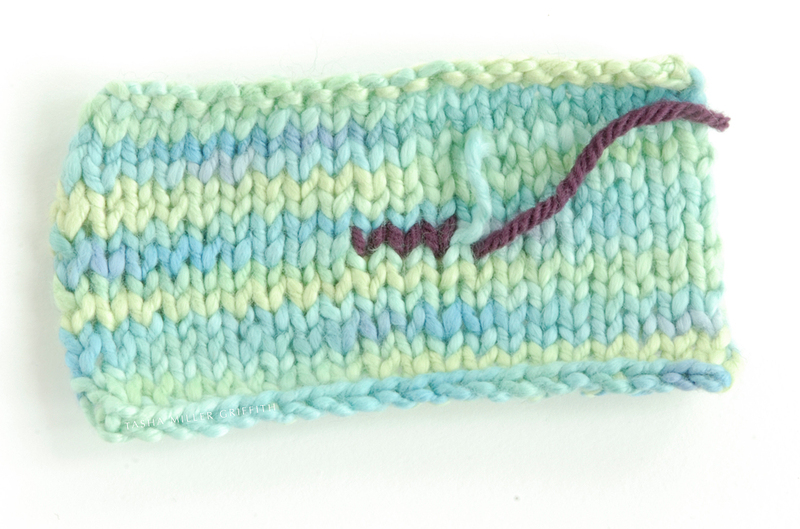 The knitting term for this is Kitchener Stitch. If you search for it, you’ll find all kinds of diagrams and instructions, but the only way it ever makes sense to me is just to look at the knitting and follow the path of the yarn. 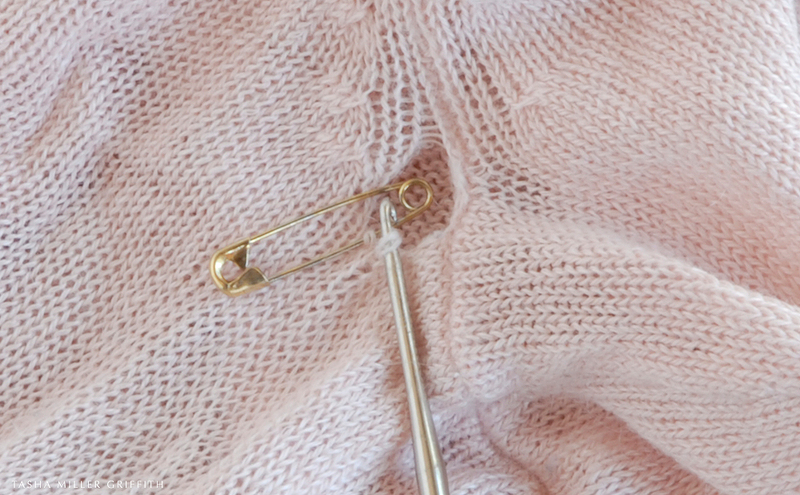 Start a couple stitches away from the hole to make sure that you catch all the threads around it, and to practice moving the needle the way that the yarn goes. When you get to the missing area, try to keep the pattern going. 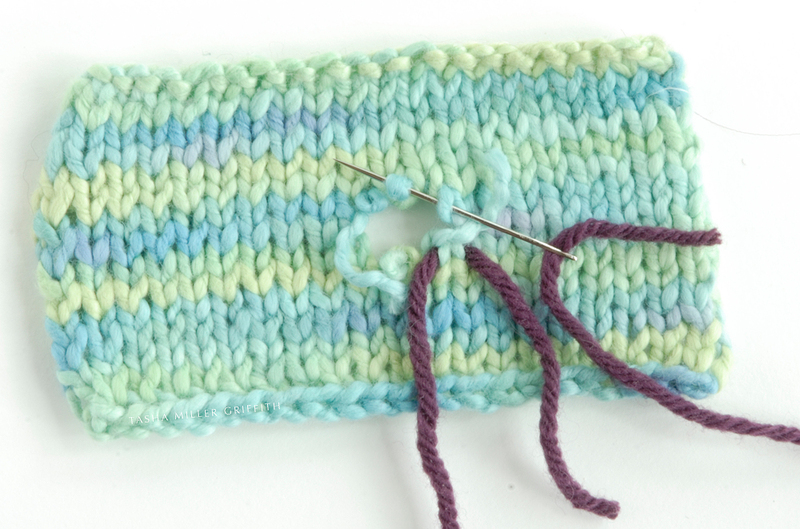 This will involve going through a stitch above and a stitch below the hole, then the next stitch below with the same stitch above, or a similar pattern. I’ll say it one more time, the mending yarn needs to replace some of the yarn that broke, so let it be there and don’t pull too tight. I fixed the sample from the right side, and the cream knit pants from the wrong side. You can do either one, whatever works best for you. Just check the public side if you are working from the inside, and make sure no stitches that you don’t want to show are showing. For a little hole like these, we’re just about done! 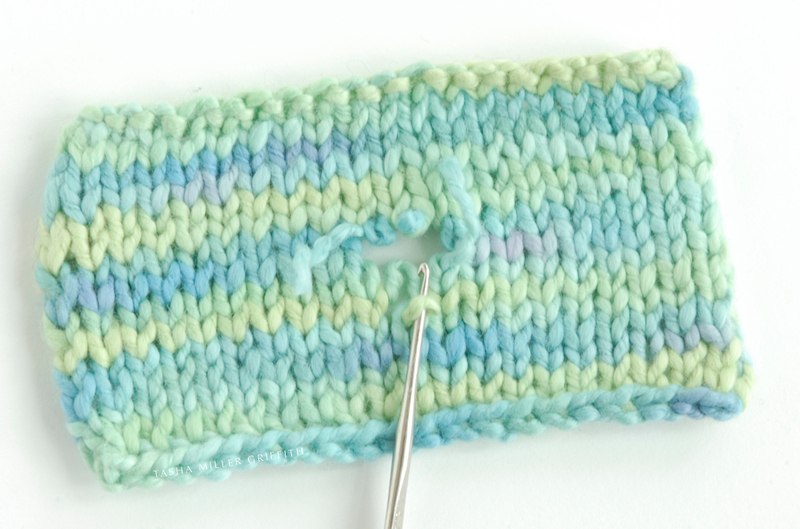 If you are tracing the knitting stitches with mending thread, keep going past the hole to make sure that you catch all the stitches which the broken one was connected to. End with a couple of backstitches to make sure that everything will stay in place, and leave a short tail of the mending thread or yarn on the wrong side so that they don’t pull out. With thicker yarns, you can use a sharp needle to bury the mending yarn, and any leftover ends of the original yarn, by piercing the back side of the nearby stitches. The finished repairs. 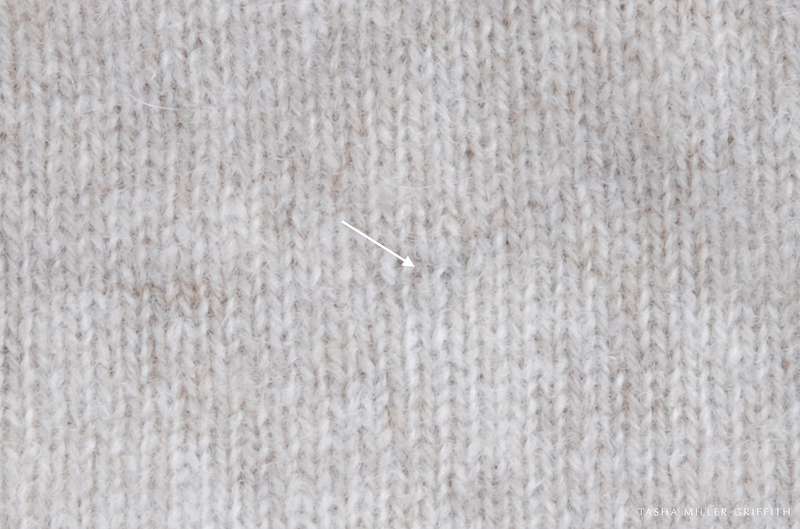 Believe it or not, the arrow points to the replaced stitch in the cream knit. The green sample still has two ends to bury in the back. If you have questions about mending something, or an unusual repair you made to share, I’d love to hear about it, do share! 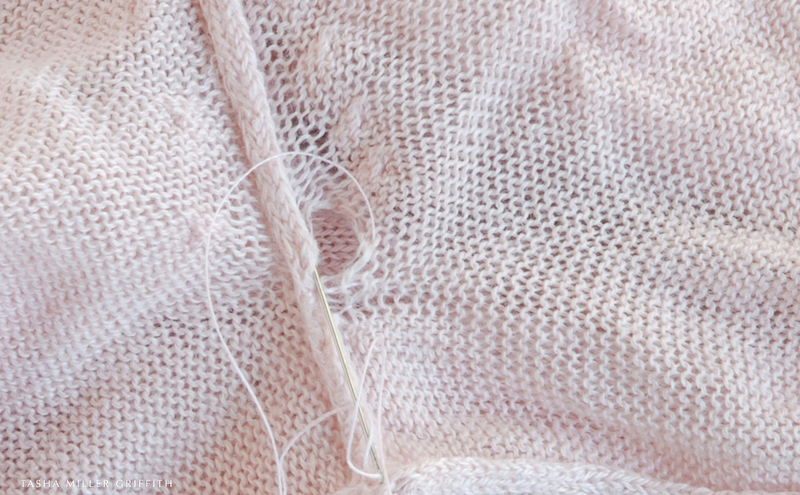 This entry was posted in Care & Maintenance—Remake—Repair and tagged clothing, diy, fix a hole, fix a knit top, fix a sweater, glorious mending, knit, make do and mend, mending, repair, repair is beautiful, sweater. Bookmark the permalink. ← Simple Homemade Cheese – Goat Cheese and Paneer too! This post reminds me of a question I have regarding clothing worn beyond wearable – is there a way to recycle (mostly cotton) clothing? I have shirts that are more holes than fabric, and jeans of the same wear level. So not candidates for donation. Any thoughts? This is an interesting question, for sure. My own practice is to cut up worn out clothes, especially cotton knits, for rags to use in cleaning the house, etc. Ravel-prone fabrics like denim are not as great for that, although you could (if you feel so inclined) cut out any whole remaining fabric and sew it into something else – a tote bag, a dog bed, something tough. Also, I know there are some industrial uses for waste cotton fiber that’s recycled, and at least some agencies that take donations pass on some clothes that are too worn to be sold to be recycled. It can be hard to find out if this is happening because thrift stores want you to think that whatever you give them will be sold or donated overseas first, that must be better PR for some reason. I’ve been meaning to call some more of the local thrift stores and see if I can find one that will take worn out clothes for recycling, but haven’t gotten it done yet. In some bigger cities I think there are bins for this, but not here that I know of. If you find out anything more please pass it on, I will too. I would love to find a way to have my old clothes shredded for new insulation! Until that day, I think I will trade them in for a pumpkin via the worm bank. You can definitely try! I haven’t had a whole lot of luck getting fabric to break down in my compost, but maybe with the worms? Also, a family friend in Albuquerque buries paper and old clothes to build up the berms he uses to catch water. UPDATE: Goodwill takes clothes too worn for reuse, and fabric scraps, for textile recycling “at all locations”! Oh, good tip! I recently mended one of my bf’s sweaters, and totally did’t think of that. Thanks, I’m glad it’s useful! It is not clear what you are doing with the crochet hook. You hook yarn near the hole, but then what? The next photo shows needle and thread, so what did the crochet hook do? Thanks! Hi Christine! I actually went over that process in another post, here: https://tashamillergriffith.com/2012/12/14/how-to-pick-up-a-dropped-stitch-in-knitting/ It works the same way in knitting as it does when you’re fixing something knitted. Good luck! Great job Tasha. It reminds me of a sweater repair I had done a few years ago called Invisible Reweaving. Check it out. Hi Odile! So, you’re right that crocheted and knitted fabrics have a different structure, but the principle is basically the same. If the hole is small, take sewing thread and a small sharp needle and work from the back side, picking up little stitches and gently pulling the hole closed (not too tight or it will pucker). Make sure you catch any loose/broken yarns with the thread to hold them in place. 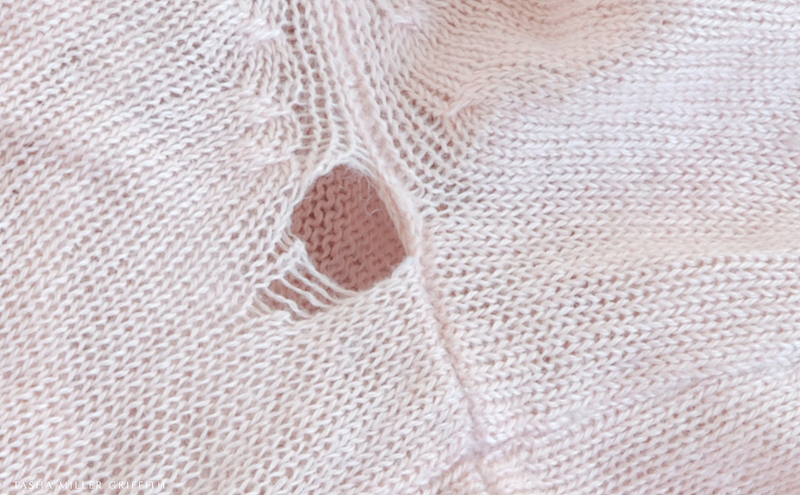 If the hole is too big for a little invisible mend like that, you’ll need some kind of patch or darning to fill the empty space. 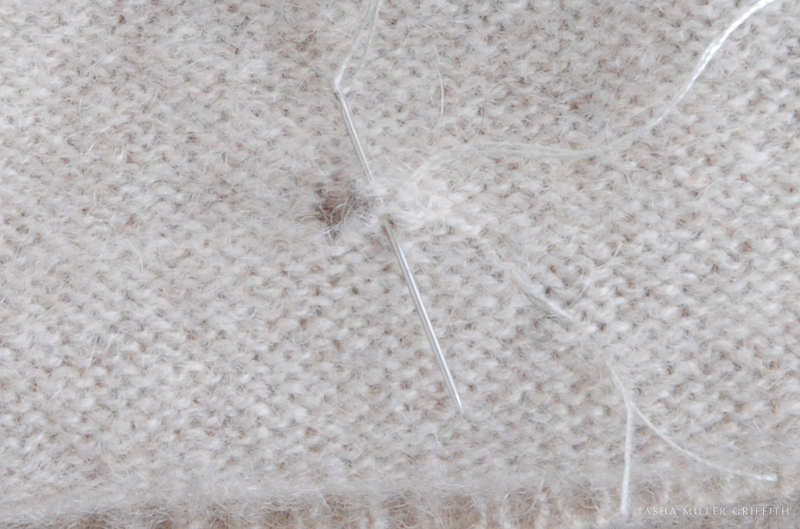 Visible mending can look very cool (check out Tom of Holland’s blog on that). 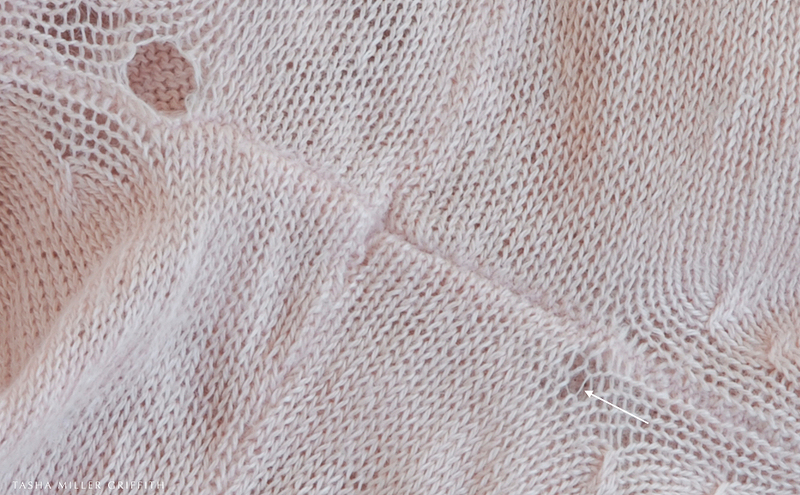 Or if you know someone who crochets, they might be able to help you mimic the stitches with a yarn that’s close to what the sweater is made of, for a more invisible fix. I hope that helps! Thank you! I just mended my favorite sweater, saving it from the recycling bin, as well as a baby sweater knit by my sister. Not as pretty as yours, but I’m so happy to know what to do! That’s fantastic Reva! Thanks for letting me know! 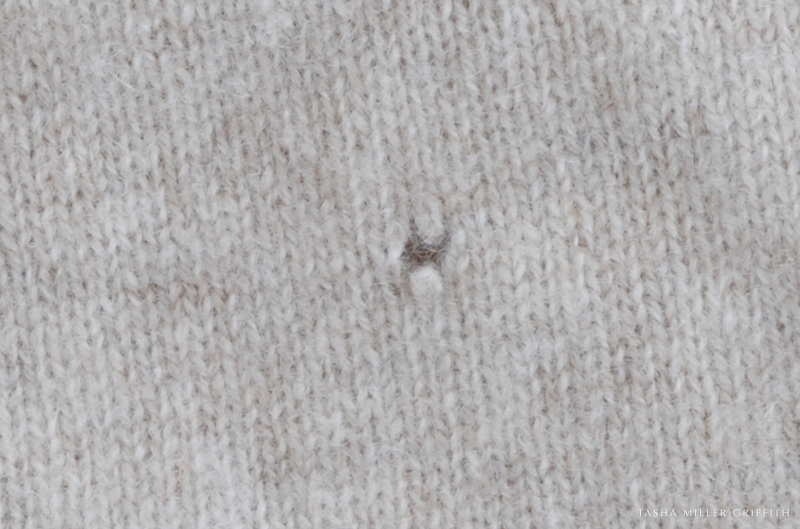 I found your blog googling about how to fix small holes in a sweater. I just recently got a hole in my favorite sweater. I was going to take the sweater to the cleaners, but after reading your blog I realize how detailed the repair needs to be, and I’m worried the cleaners will ruin it. Do you have a business or do this kind of work on the side? You did such a great job in the pictures, and I have read the directions over and over, but have no experience with sewing or knitting. The sweater is very thin, it’s spring sweater. Any chance I could hire you to do this repair to my sweater for me?? Hi Fran, a lot of dry cleaners also do repairs, but the quality depends on how they do it. You could take it there and ask them what they can do to fix a little hole like that, or ask to see examples of repairs they’ve done before. I’ll also send you an email (check your junk folder if you don’t see it) and we can talk about whether it makes sense for me to fix it. Thanks! Three years ago I bought this super expensive (for me) sweater as a gift for my daughter. I just rescued it as she was about to donate it to Goodwill. I think I can repair it but I would love your advice. 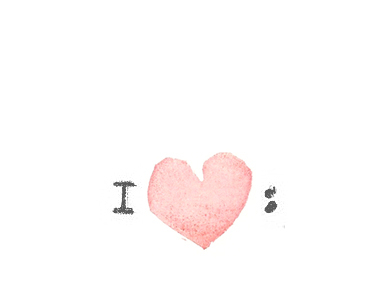 May I send you a photo of it? Sure! My email address is on the contact page. I’ll look for your message.